Music makes the people go to the zoo? - You don't know me. Ahh Jib Jab. Hillary and Barack, singing along to High School Musical. Kinda creepy, but cracked me up. And I think it's caption time!!! "And you thought birthin' octuplets was bad!" LOL!!! Omg. I laughed so hard. You rock. You should see what she did in the Humpback section! The images I'm getting aren't nice. "Abner! Abner! There's gotta be hundreds of sardine's up here"
"And folks say vaginal rejuvanation is strictly for show..No one really needs it. Have eight kids and say that." 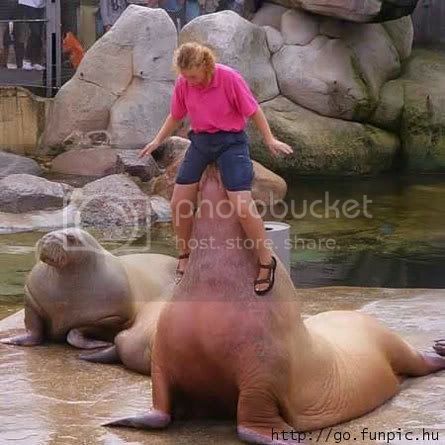 "Jenna much prefered her job at Seaworld to her s*x life. Her husband just wouldn't go there." "Wait...you didn't know you were pregnant?" " A picture from one of the US's landmark sexual harasment cases." LOL! Haha! I've purposely been keeping the computer away from Little Random's sight when I open up emails from LJ. I don't want to answe questions about what's going on with that womans no-no place. -"Join the cheerleader squad, mom said. Meet new friends, she said..."
LOL!!! I can't pick a favorite. "I heard her say earlier one of her engine valves blew a seal... so I figured the least I could do was return the favor!"